Is USPS Priority Mail® a part of your e-commerce shipping strategy? With delivery to most domestic locations in just one to three days, Priority Mail is often the most affordable shipping option and also includes free USPS Tracking®, free Package Pickup, free USPS shipping supplies and up to $50 of insurance with most shipments. If your e-commerce business ships small, dense packages over short distances, then you could save even more on shipping by using Priority Mail Regional Rate, both over private shipping carriers AND other USPS services. Priority Mail Regional Rate postage pricing is based on box size and its destination. For instance, a shipment that’s going across town will cost significantly less than a shipment going across the country. The boxes do have weight limits but are generous and tend to satisfy most shippers—both Box A options have a maximum weight of 15 pounds, while Box B options have a maximum weight of 20 pounds. If you’re looking for a quick way to visualize USPS Zones based on your location, this USPS Dynamic Zone Map lets you generate a color-coded map based on whatever ZIP Code you enter. 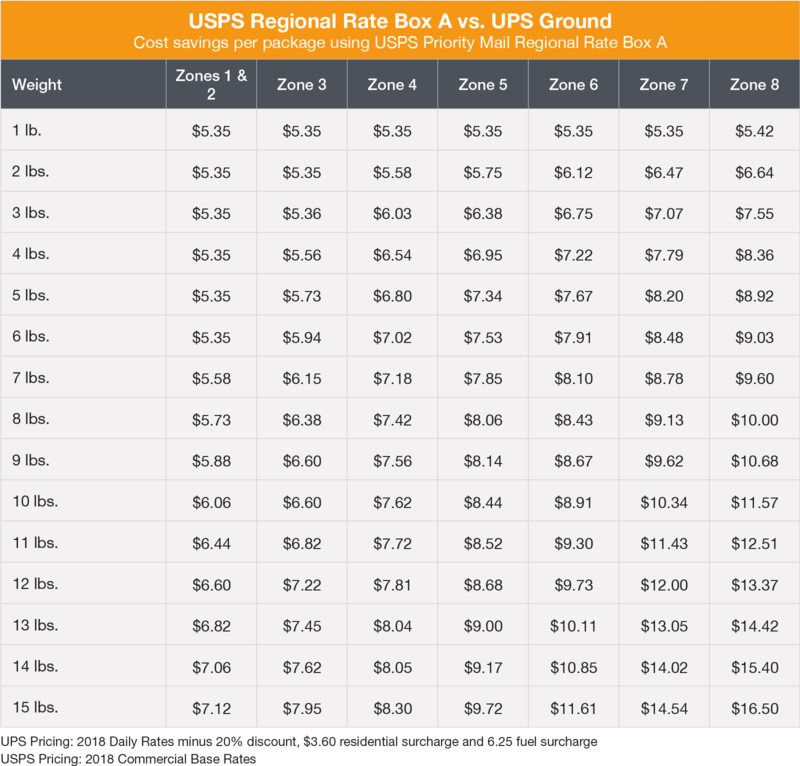 Wondering when you should use Priority Mail Regional Rate instead of Priority Mail Zone-based pricing or Priority Mail Flat Rate? To find out which option is right for your shipment, you’ll want to compare your box size and destination. For example, using Priority Mail Regional Rate Box A is cheaper, across all Zones, for packages weighing 3 pounds or more, but if your package weighs less you’re better using the Priority Mail Zone-based service. We’ve put together a comprehensive blog post to help you understand all Priority Mail options, including Regional Rate—find it here. So, if you ship items that weigh up to 20 pounds that can fit in one of the USPS Priority Mail Regional Rate boxes, now would be a great time to make the switch. It could end up saving you quite a bit of money on shipping during the upcoming holiday season and beyond.